Few months after her publicised engagement to her lawyer boyfriend got dissolved, Toyin Abraham has found love again. Seven months ago, the Nollywood excitedly shared the news of her getting engaged to Ibadan based Olugbenga Olujimi, a legal practitioner. 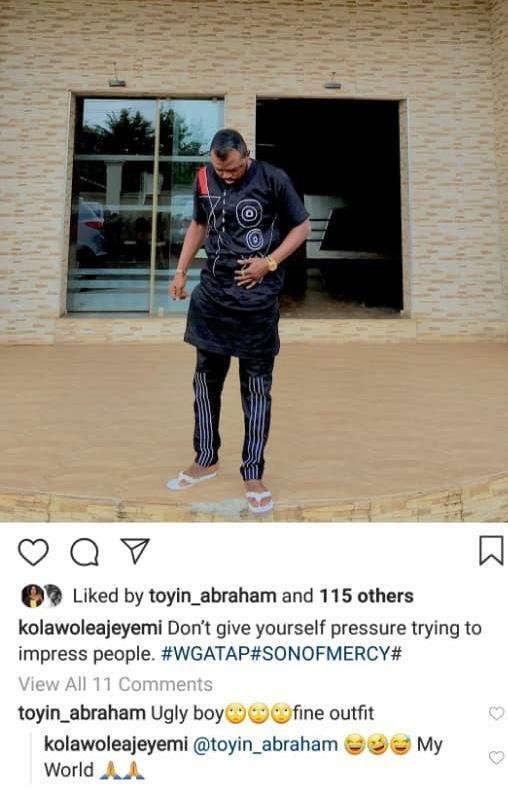 Now, Toyin Abraham, who only yesterday was accused by her ex-husband Adeniyi Johnson of refusing to grant him a divorce, has found another lover who she’s said to be head-over-heels in love with and he is her fellow Nollywood actor, Kolawole Ajeyemi (known in the Yoruba movie sub-sector as “Awilo”).The two reportedly have known each other within the industry which they work for nearly a decade but only started dating a couple of months ago. Our source further informed us that while Toyin has had an affinity for men who work in the same industry as her, this is the first time she’s with someone who shares her dreams and passions.On his part, Ajeyemi who is based in Abeokuta is said to be proud of the fact that he’s with Toyin and describes her as his “world”. He has been around for over decade and was for a long time a bit-part character in many movies, often as a gangster or love interest.